The 2 board-sports that have had the biggest impact on the island of Fuerteventura are windsurfing and kitesurf, mainly due to the International windsurfing and kiteboarding championship that takes place every year in Costa Calma, and has been organised there on the beaches of Sotavento (Pajara) since 1985. 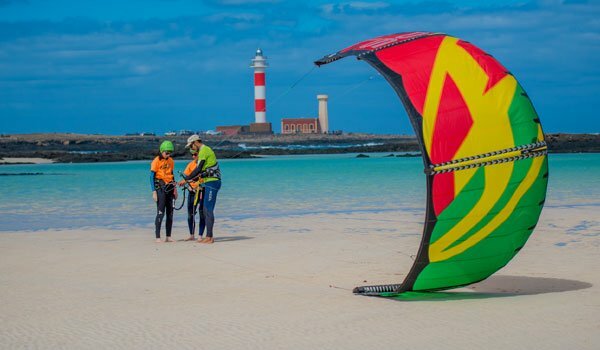 The ideal weather, and good windforecast and wind conditions have made Fuerteventura the ideal island for kite surfing. We recommend the months from May to August for better and strongers winds conditions, even you can kite almost everyday in Fuerteventura. This beach, who’s original name is “Punta Prieta”, is nowadays better known as Flagbeach. This beach is exposed to the prevailing trade winds in spring and summer. It receives moderate waves and has excellent conditions fun kiteboarding sessions. This beautiful beach is part of a protected area, facing the island of Lobos. With its gentle waves that break on different peaks it is an ideal spot for kiters of all levels and ages. In the following chart we show the best way to enter and exit the water with your kite board on the famous beach of Corralejo. 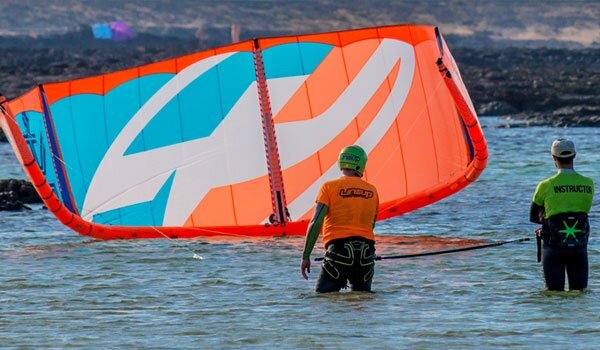 Manu Taub, who holds 2 kite speed records, has set up his center “Line Up Ocean Sports Center” in Corralejo, in the north of Fuerteventura. 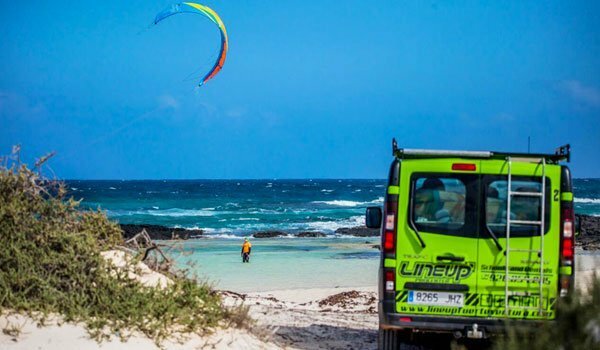 At Line Up Ocean Sports Center, you find our kite surf school where you will be able to book your course and learn how to kite with a professional and experienced team. For experienced kiters we propose high quality rental equipment and in our shop you will find kites and boards for great prices ! You can even come and enjoy your holidays in our Kitecamp in Fuerteventura. A very nice Beach entirely covered with white sand, just a few minutes from the center of Corralejo. One of the best spots in the north of the island of Fuerteventura for kitesurfing and windsurfing predominant wind of the North sector. The optimal Wind conditions are those from North or Northeast direction, the spot its ideal for all levels, both beginner and advanced. With East winds only recommended for advanced, which can go well upwind. Like offshore winds. Important attention with the bottom / volcanic low, it is advisable to sail preferably with medium to full tide. Although it is possible to navigate with optimal conditions throughout the year, the most constant wind season would be between March and September, with the trade winds. Located at the northernmost point of the island of Fuerteventura, next to the fishing village of Majanicho, we find the point break homonymous “Majanicho Outside”, a right bottom of volcanic stone in its entirety. The ideal winds to navigate this wave are the East quadrant, Northwest; although it is possible to surfer this wave spot with almost all the winds. It is recommended to navigate this Spot if you have a high level and/or expert since it is very difficult to access. Better surfing with high tide, since access is safer, and there are usually fewer surfers. It is frequented mostly by local kiters. A spot focused on the freestyler as it is a flat water lagoon, ideal for those passionate about extreme maneuvers. The access to the Cotillo lagoon includes a small area of white sand beach, which is surrounded by volcanic lava, partially closing the lagoon we find a small exit to the open sea. This area is practicable only with medium to high tide, since at empty tide the lagoon dries almost in its entirety. A wide sandy beach Located west of the island of Fuerteventura, just 500 meters from the town of Cotillo. An ideal beach break for the free rider who wants to experiment with waves, although it is not just a spot focused on the wave, since passing the surf can be navigated with total freedom. The best winds are North and Northwest, also Southwest since other directions would be gusting. This spot is recommended for all levels of riders but preferably if it is able to jump, because due to the beach break that breaks constantly it is very difficult to pass without jumping. Located in the south-west part of the island is a spot difficult to access by car due to its dirt road that crosses the southern mountains of Fuerteventura, the most isolated and wild area of the island and maybe from all Canaries. Cofete beach is kilometric and paradisiacal, It is advisable to be accompanied regardless of the level of each kiter. The ideal wind is the North, although you can navigate with the Northwest. The sea is a confluence of currents, where the sea of the north meets the south, which can cause great swells. Known worldwide for hosting a part of the Kite World Championship and Sotavento Windsurfing, where our founder Manu Taub has achieved two world kite speed records. It is a beach of white sand, which at full tide forms a lagoon 200 meters wide by 4 kilometers long, which is suitable for all levels and styles. The predominant wind is the North, although very gusty, offshore practically all year round. 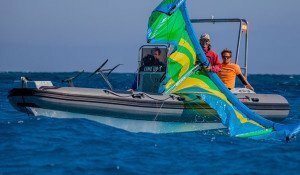 There is also the option of sailing in the open sea but taking into account the direction of the wind since it is mostly offshore or side off. As in Playa de la Barca (Sotavento Lagoon), usually, there are offshore or side-off winds, with the lack of a lagoon, since you have to sail in the open sea, with much smaller dimensions and not so abundant sand. Spot located on the east coast of the island of Fuerteventura, a fishing village a few minutes from the capital of Fuerteventura. A spot that works with northeasterly winds and focused on the modality of kitesurfing with waves. Very frequented by locals, since it has a difficult access because of cobblestones. A lot of windsurfers, and surfers in general. Area not delimited between the different disciplines, for that reason it is advisable to use common sense, and taking into account, that the surfers always have the priority. For kiters from level upwind onwards. The best tides are the same as any rock area, the more full the better, although the shape and size of the waves vary.